Have you ever found yourself squinting through the gloom trying to spot your dog on a dark, dismal evening? Well it’s going to get even darker in the evenings when the clocks turn back 1 hour in a couple of weekends on the 28th! Early morning and evening walks can be made much safer for your dog with some flashing or reflective hi-viz dog products. Being easy to spot is especially important if you walk your dog near busy roads or loose in the fields. Light up your dog like a Christmas tree! Well, not quite, but our new LED Illuminated Ring Collars are extremely bright and durable. Unlike some LED collars these are 100% watertight so you won’t need to watch your dog like a hawk every time you come across a puddle. The collars are available in six different sizes so you can ensure you get a perfect fit for your dog. Choose from red, blue, green or white. Replacement batteries are also available. New this month in the zooplus shop is this snazzy addition to our popular Polar Bear Dog Coat range; Dog Coat Polar Bear Black with Reflectors. It comes with hi-viz yellow straps on the chest and around the abdomen as well as reflective tape on all seams. Great for dark coloured dogs like this little spaniel. Windproof and waterproof, this really is a dog coat that ticks all the boxes. The adjustable fastenings will help you get a perfect fit to keep your dog warm, safe and dry on all those long autumn and winter walks! For great value winter safety, try our pendant Flashing Dog Pendant Waterproof which is visible up to 800m and simply clips onto your dog’s collar – now only £2.99! 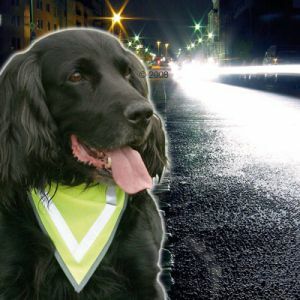 Or for the more fashionable pooch, take a look at our Reflective Safety Dog Bandana. This bright bandana with reflective strips doubles up as a cute accessory during the day and as a vital peice of safety equipment on a dark evening. 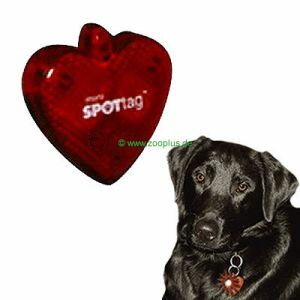 This entry was posted in Dogs, New Products, Tips and tagged dog coats, flashing dog collar, high vis, high vis dog, high-viz, led dog collar by emmas. Bookmark the permalink.